How To Flash On Oppo F3 Plus CPH1611 - QPST is one of the simplest tools that can be used to flash, unbrick (Debrick) Qualcomm android devices. Using QFIL in QPST you can flash and unbrick (debrick) Oppo F3 Plus CPH1611. While other applications in QPST can be used to backup and restore, repair and refurbish, debug and even write Qualcomm android devices partitions. This tutorial focuses on how to flash and unbrick (Debrick) Qualcomm android devices using QFIL. Download and install and install QPST on your PC. 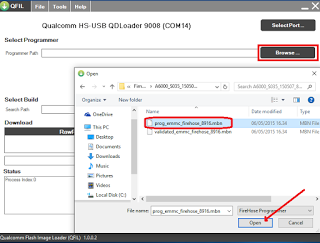 Download Qualcomm android device drivers. 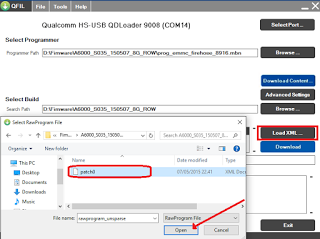 If your device has been bricked; either that it displays QHUSB_BULK 9008, QHUSB_BULK PID_9008, QHSUSB_BULK 9006, CS Emergency or any other similar message, it is necessary that you install Qualcomm HS-USB Drivers on your PC. You can download HS-USB Drivers from here. Download the Stock Firmware for your Oppo F3 Plus CPH1611. NOTE: QPST QFIL can flash .mbn and .bin files with .xml file map only. If the firmware you downloaded is compressed in a .zip or .rar file, decompress/unzip the firmware you downloaded in a folder on your PC. Now, remove the battery from your phone. If the phone battery is sealed (not removable) power off the phone and connects your phone to the PC using its compatible USB Cable. 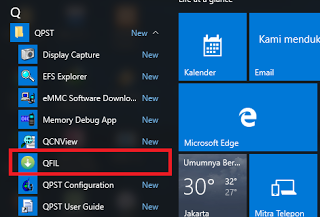 Now, launch/open QFIL by i- go to Local Disk C:/ >> Program Files >> Qualcomm >> QPST >> bin >> QFIL.exe and open QFIL.exe as Admin, ii- Click iCon >> All Programs >> QPST >> QFIL and launch/open it. When QFIL is launched, it should display your connected phone's mode and its COM port. Locate Load XML and click it. QFIL will automatically open your firmware folder. If it doesn't, navigate to the firmware folder and select rawprogram0.xml and again, select patch0.xml. Finally, locate Download and click it. If all the configurations are correct, QFIL will begin writing/loading the selected stock firmware partitions on your phone. In less than 5 minutes, the flashing operation should have completed. When it does, your phone should reboot itself and if it doesn't, disconnect it from the PC and reboot the phone. This is a straight step by step guide on how to unbrick (debrick) Oppo F3 Plus CPH1611 using QPST QFIL, circumstances, device state/status, device models/brands, and other factors might change your steps. If you have issues with flashing or unbrick (debrick) specific Qualcomm android device, let me know in the comment and I shall give you a precise guide. 0 Response to "How To Flash On Oppo F3 Plus CPH1611"